Hi all! Happy Thursday! I’m particularly happy that it’s Thursday this week, because hubby has been working extra long hours these past few days, so it will be nice to have him all to ourselves this weekend. Today, I have for you a shaker card for my cousin’s shower gift. 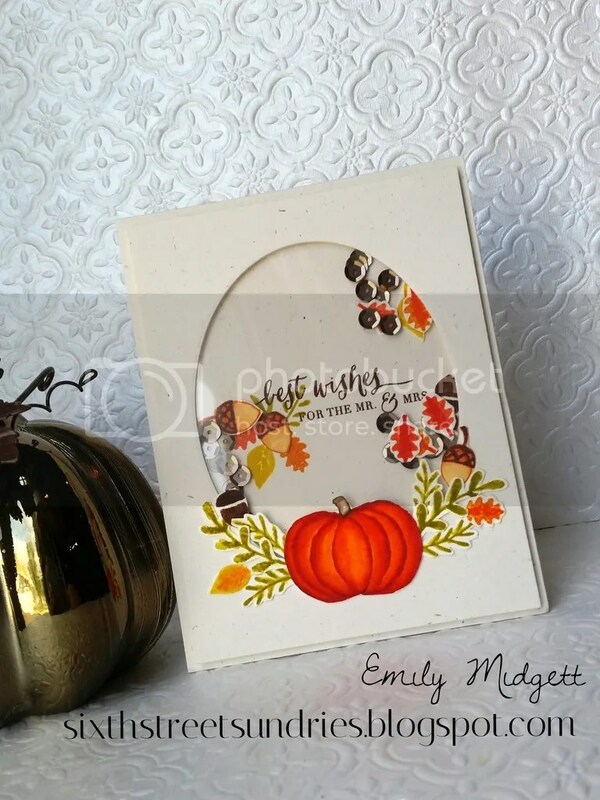 Her wedding is an homage to all things autumn: the colors, the leaves, the flowers, the pumpkins, so I wanted to convey that in the shower card. 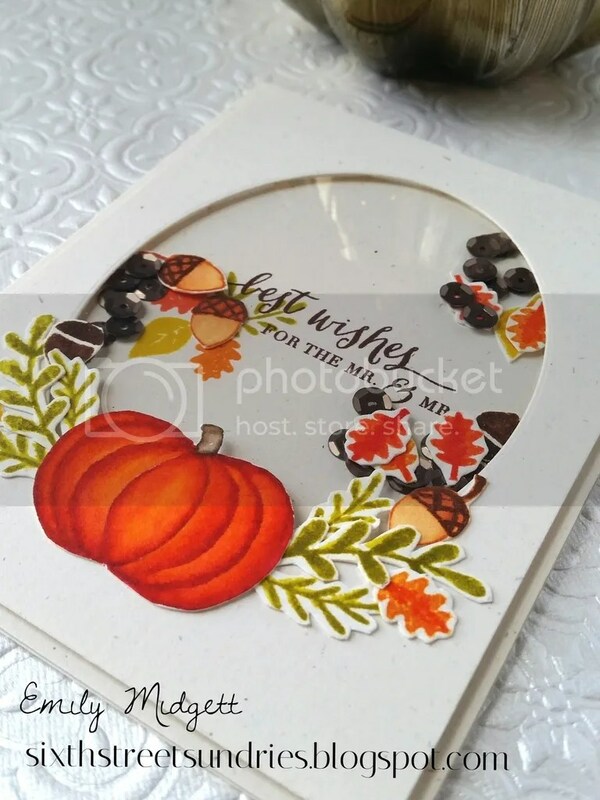 I used Hero Arts’s Holiday Petals and Leaves stamp set, which I purchased because I loved the more winter/Christmas-specific images, but ended up loving the fall images, as well. To begin, I stamped a fair amount of the leaf and acorn images using various Distress Inks onto watercolor paper. I then used deeper shades of those Distress Inks, my paintbrush, and water to add shading and depth to the images, particularly the leaves, as I wanted those to look very autumnal and colorful. I also wanted to have a pumpkin in there, so I drew another pumpkin and colored it with my Zig markers. (I clearly need a stamp set that contains a pumpkin…) I fussy cut all of the images out (definitely not the most fun task…made me wish hard for matching dies) and set them aside. For the sentiment of my card, I used the Wplus9 set Fresh Cut Leaves. I particularly love the combination of fonts used in this set; the calligraphic script font juxtaposed with the classy printed font is so lovely. I stamped it on the card base itself in dark brown ink, then added a couple of stamped leaves from the HA set and an pre-cut acorn in a little cluster in the corner. I then filled up the shaker portion with the fussy cut leaves and some dark brown sequins. The top panel was created with a rectangular panel of card stock from the same cream color (cut at 4 x 5 1/4 in). I then die cut the plain oval from the Avery Elle Sweet Scallops die set. (That die set is crazy useful… I use it on practically everything these days.) I put the pumpkin, some leaves, and some acorns in a swag-like cluster at the bottom of the oval window, making certain to leave plenty of space between the top of my pumpkin and the bottom of the sentiment. I hope you enjoyed this card! I love the way the leaves look when you shake it up, like leaves floating to the ground in real life. Back soon with a Christmas card! (I waited until October to begin creating them, and I can wait no longer.) Have a wonderful Thursday, friends!